We’ll suddenly get panic when any trouble arises in our pretty devices such as smartphones since they have a great impact on our daily lives. When any issues occur we should have to solve it as soon as we can. Are you an iOS user? Having any issues with your device? then this article might help you to get rid of all your system bugs & issues. It is not an easy task to manage your device by yourself especially if it is down with major technical failures. Sometimes you may have to visit service center for solving issues if you are not equipped with specific tools to cope it. Joyoshare UltFix is a powerful utility that can cure almost all problems except hardware-related issues with your iOS. If you have Joyoshare UltFix installed on your computer then you can forget about the physical service centers. You can solve all most all issues simply by yourself irrespective of its complexity. All you have to do is to let the utility know what your problem is… then after applying some clicks your issue will get resolved. One of the main advantages of using Joyoshare UltFix over other similar software is that you don’t have to worry about losing your valuable data. Most of the technicians do a complete removal of the software and re-installing it. This method clears all the files/data that we have on our device. But if you are using UltFix then your data will be safe. Joyoshare UltFix helps both registered and unregistered users to enter the recovery mode in one click. So after the normal reboot with the help of recovery mode the device can be reinstated. After the successful completion of the task, the user can exit the recovery mode. UlltFix supports iPhone XS, iPhone XS Max, iPhone XR, iPhone X, iPhone 8 Plus, iPhone 8, iPhone 7 Plus, iPhone 7, iPhone SE, iPhone 6s Plus, iPhone 6s, iPhone 6 Plus, iPhone 6, iPhone 5s, iPhone 5c, iPhone 5, iPhone 4s, iPhone 4, All models of iPad Pro, iPad Air, iPad mini, and iPad, iPod touch 6, iPod touch 5, iPod touch 4, iPod touch 3, iPod touch 2. Means all devices can avail the benefit of using this ultimate recover utility. Now let’s see how to Install Joyoshare UltiFix and Repair your iOS Device. There is no need to have technical knowledge to use this software to repair a device. You can simply achieve your goal with just a few clicks. (Note that this utility is not a freeware although you can try demo version, in order to get the full version you have to buy any of these (Single License-$39.95, Family License-$49.95, Multiuser License-$69.95) licenses. 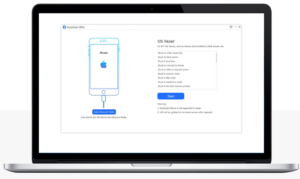 After Installing Joyoshare UltFix Connect your iPhone, iPad or iPod which you want to repair. Then you will get two modes (Standard & Advanced) to repair your device as shown below. It is recommended to go for standard mode first since it protects your data from losing. Go for advance mode only if the standard mode failed to repair. You will have to suffer from losing your data if you opt advanced mode first. Select one and click next. You will get a window to download the latest firmware that is needed before repairing your device. Select the model of your iOS and click download. click on the repair button and sit back freely. Joyoshare UltFix will help you to recover your life companion. We can handle an issue in multiple ways, but it is always better to choose the simplest and most efficient path among those. Joyoshare UltFix is a fully fledged utility that can help you in dealing with a number of problems relating to iOS system.